As smart devices evolve, we’re presenting with even more ways to connect our bodies to the Internet. From smart contact lenses to electronic pills, and every other tracked device, humans are becoming more and more like machines. While there are certainly benefits to specific types of monitoring, there are also risks. The risk of having your body hacked is high up on the list. While there haven’t yet been any cases of bodyhacking in real life, wireless medical devices run amok or hacked have been featured in more than one recent TV medical drama. 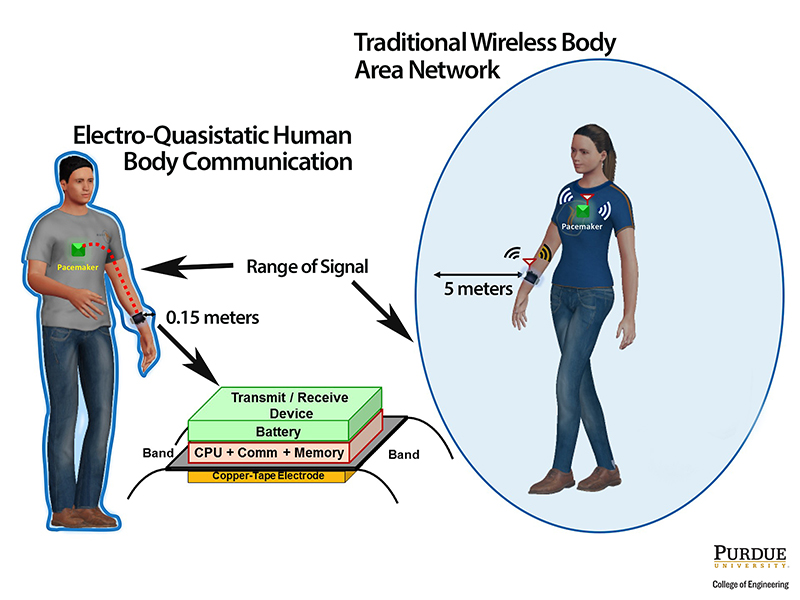 Human body communication or HBC, the electromagnetic field that powers wearable and implantable devices, is eminently hackable. The eM signal propagates in all directions since the human body’s high water content makes it a great conductor of wireless signals. Body area networks using Bluetooth can be picked up within a 10-meter radius. New software developed by Sen and his electrical and computer engineering students at Purdue University tightens the Internet of Body (IoB) field to a mere centimeter from the skin. Body area networks using Bluetooth can be picked up within a 10-meter radius of the body and use 100 times more energy than Sen’s solution. “We show for the first time a physical understanding of the security properties of human body communication to enable a covert body area network so that no one can snoop important information,” Sen said. The next step for Sen’s team is to continue working with industry and government to couple electro-quasistatic-range signals and incorporate them into a dust-sized integrated circuit. When security issues have been addressed, doctors will able to securely reprogram insulin pumps and pacemakers without invasive surgeries, perform high-speed brain imaging, and, with the advent of closed-loop bioelectronic medicine in which patients are fitted with wearable or implantable devices that act as drugs but without the potential side effects.